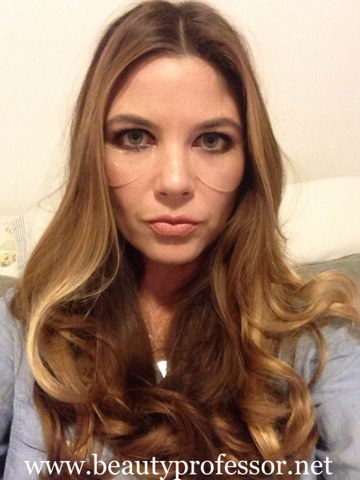 Beauty Professor: Le Metier de Beaute Ultra Hydration Eye Mask...Details and Review! 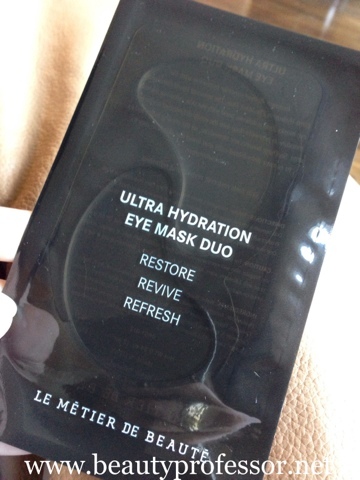 Le Metier de Beaute Ultra Hydration Eye Mask...Details and Review! Long teaching hours and the constant running of our centralized heating have certainly taken a toll on my eyes as of late; dryness, puffiness and overall fatigue are the results of compromised sleep and an arid environment. 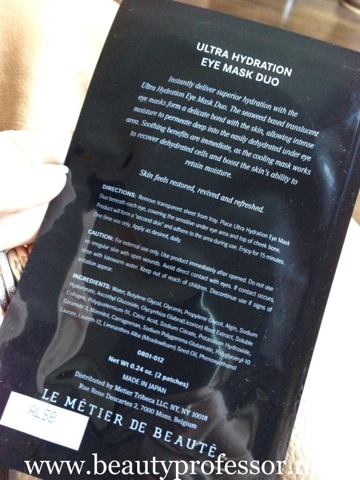 Thankfully, Le Metier de Beaute has just released the latest in skincare innovation, the Ultra Hydration Eye Mask Duo! This cooling, restorative treatment is designed to valiantly combat dehydration and in one fifteen minute session. Is portable...the individual sachets (each set contains 8 sachets) for convenient on-the-go, during travel or post-workout. Ingredients: Water, Butylene Glycol, Glycerin, Propylene Glycol, Algin, Sodium Hyaluronate, Ascorbyl Glucoside, Glycyrrhiza Glabra (Licorice) Root Extract, Soluble Collagen, Polyquarternium-51, Citric Acid, Sodium Citrate, Potassium Hydroxide, Ceramide 3, Mannitol, Carrageenan, Sodium Polygamma Glutamate, Polyglyceryl-10 Laurate, Laureth-12, Limnanthes Alba (Meadowfoam) Seed Oil, Phenoxyethanol. 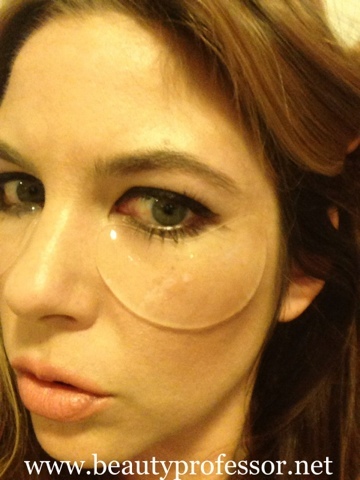 Above: Each sachet comes with two eye masks that adhere to the under eye area like a second skin. The end of an excruciatingly long week proved to be the perfect time to experience the wonders of this mask duo...prior to use, my eyes were tired, puffy and dehydrated! 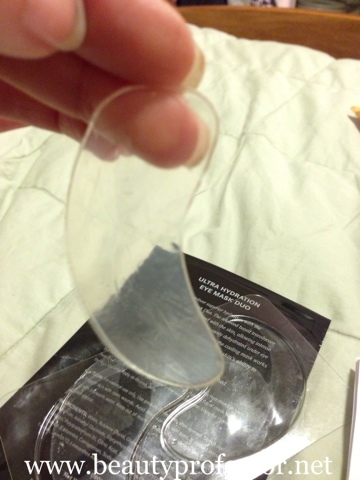 Using the mask duo was incredibly easy...I peeled opened the individual sachet at the far corner, removed the thin plastic tray containing the masks and carefully remove each mask from their individual compartments. The masks themselves are gelatinous in nature...almost like a thicker contact lens (I've worn them for years, so it was the first comparison that entered my mind). They are flexible, malleable and submerged in a hydrating elixir. 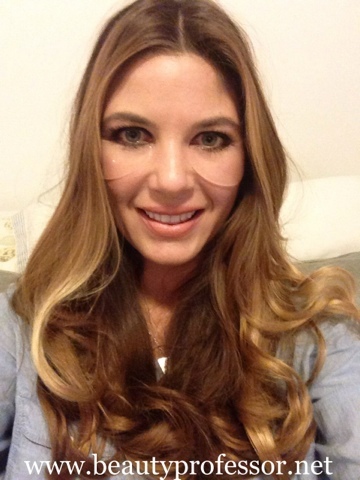 Once applied, my under eye area felt cool and relaxed and unlike other masks, this rendition never felt tight. In fact, the hydrating process was palpable! Above: An close up of the mask...the crescent shape is designed to perfectly fit under the orbital area. Above and below: The entire process was so relaxing, that I decided to lay down and enjoy decompressing. 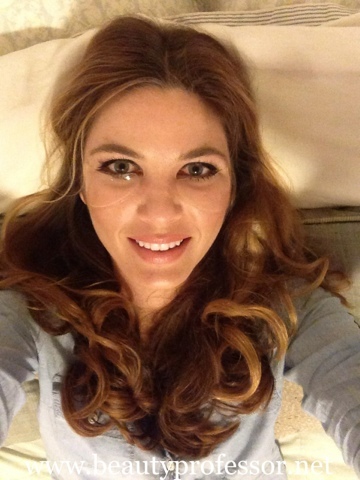 Bottom Line: After a very relaxing 15 minute treatment, the masks removed easily and neatly. Upon removal, my under eye area was transformed! The skin was perfectly balanced, extremely smooth and silky to the touch. The next day, the effects were still intact; my area felt refreshed and restored and I felt ready for the start of another monstrously long week. For those interested in trying this amazing treatment (which retails for $150 for a set of eight), it is currently available at Neiman Marcus and Saks Fifth Avenue. If you are a Southern California local like I am, I encourage you to swing by the Le Metier de Beaute counter at Saks Fifth Avenue at South Coast Plaza (714/ 540-3233) to take a peek. If you remember, please let them know that The Beauty Professor sent you...I cannot wait to hear your thoughts on this superb product! Thanks for a great and thorough review, BP! Looks like a great product. I'm not anywhere close to South Coast Plaza, but in freezing Chicago. Nevertheless, I'll be heading out to NM to get some of these magical masks and will tell them the Beauty Professor sent me! :) Thanks for this review, I'm convinced. You are too sweet to mention my name ; ) Sorry to hear that you are freezing...hope you are staying safe and cozy in during this latest Northeast storm! I cannot wait to hear what you think of the masks...do please keep me posted on your experience.